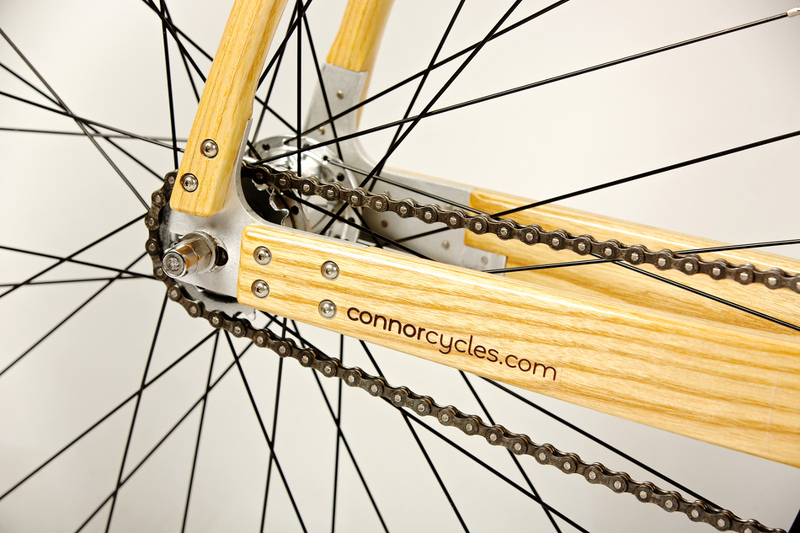 Press Release – Connor Wood Bicycles — Wood bikes from Denver Colorado. Current press release for 2013. Connor Wood Bicycles, Denver, Colorado builder of custom wood bicycles, elegantly combines form and function and provides a totally unique riding experience. Founder Chris Connor hand builds luxury sport bikes made from sustainably harvested American hardwoods. The bikes are reinforced with Kevlar and aerospace epoxy adhesives for maximum durability. They’re also protected with marine spar varnish to endure and remain beautiful for years to come. Each creation is a fully functional work of rideable art. Chris Connor points out, “Wood is a natural choice for bikes; think of its toughness and vibration dampening properties when used in sledge hammers, baseball bats, skis and snowboards. When cared for, wood will last and stay strong for decades. Reinforced with Kevlar, Connor’s bowed shaped frames give a premium ride and smoothness unlike any other bike out there.” Connor’s attention to detail and deep understanding of wood as a burly—and beautiful—raw material can be seen in the walnut details, finger joints, and reinforced seat stays that add to the frame’s dampening ability and durability. Proving the durability of these frames and showing that they are more than just something to look at, Connor Wood Bikes have shown their strength time and again. The company’s mountain model successfully completed the 2013 Leadville 100 mile mountain bike race, one of the most grueling bike races in the world. Connor’s frames have also passed the Gates Carbon Drives Systems lateral rigidity test, proving themselves to have greater rigidity than some titanium frames. A quick view of the Connor Wood Bicycles web site offers a video demonstration of the handlebars’ strength under the weight of a car. These bikes are ready for any riding challenge. Connor builds bikes in three different basic models. The Woody Cruiser is a back-to-basics cruiser with an optimal riding geometry. This bike sports an ash and walnut frame, 29” (700c) wheels, high volume tires and a simple chain drive with coaster brake. It is appointed with an elegant leather saddle and matching grips. It is a minimalist bicycle showcasing the beauty of the design with a ride quality like nothing in the world. 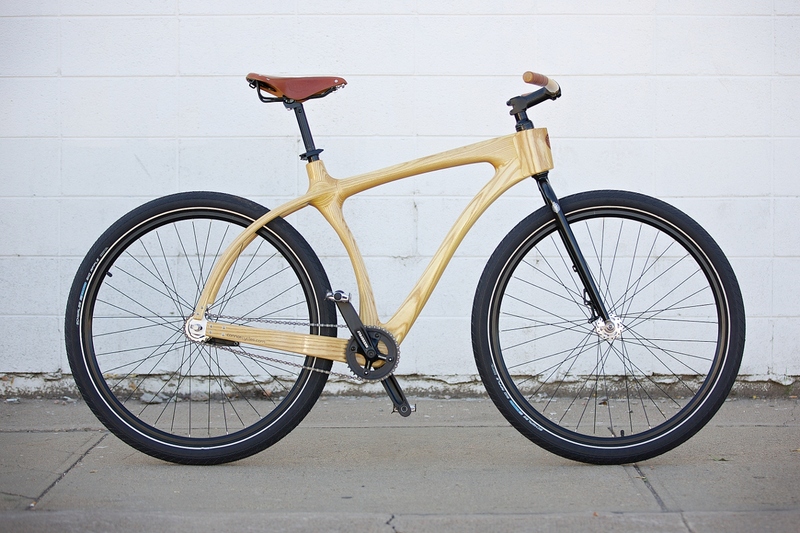 The Woody Scorcher is a luxury sport bicycle. Its sportier geometry, disc brakes, 8 speeds in an enclosed internal gearhub driven by a carbon belt drive distinguish it from the Woody Cruiser. The scorcher is the ultimate riding luxury with all the gears and brakes desired by the modern rider. The Woody Mountain bike is the ultimate marriage of form and function as a hard tail 29er mountain bike with a supple ride and arresting beauty. This bike is ready for the trails with front suspension, chain or belt drive. It boasts the best modern mountain biking technology in the most unique way possible. Each Connor Wood Bicycles creation is made to order in small, medium, and large, and can be customized to each rider’s desires. Woody Cruisers start at $3,500 USD, the Scorcher at $4,750 and the Woody Mountain at $7,500. For media inquiries, high resolution photography or for more information about Connor Wood Bicycles contact Chris Connor, echrisconnor@yahoo.com or 720-369-9881.